TOP OF FIRST HOUR NEWS: Mon., Apr. 8, 2019 — Church yesterday was AMAZING. I’ll get podcast out later today. We had our Couple’s Seminar, I hear it was excellent. Thank you. Patrol Agents Granted Wide Latitude Trying To Catch Drivers… (MSN) An LA Times & ProPublica investigation found every 9 days there’s a crash by smugglers, sometimes in high-speed chases, unrestrained children, packed vehicles. They run over spike strips or get boxed in, run off the road, or spin out, sometimes flipping. At least 250 were injured in 4 years, and 22 dead. Not that many actually. Media want to blame Border Patrol. Agents have been harmed as well. Human smuggling prosecutions have increased 25%, and those injured in pursuit crashes has increased 42%. Animals. There’s record-breaking violence in the Cartel-ravaged Mexico. Impossible challenge of tracking visa overstays… (San Diego Tribune) Visa overstays account for 44% of the unauthorized immigrant population. (I thought the liberals said they were most — that’s not most.) DHS estimated 701,900 visa overstay incidents in fiscal 2017 — and that only accounts for air and sea travel, almost double the number caught crossing illegally (so about even if you count those not caught...?). 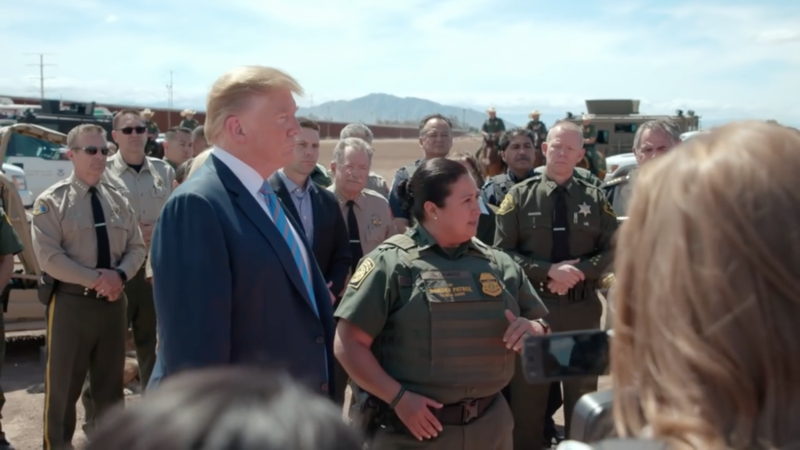 Unless you pose a national security threat or have racked up a criminal record, “There’s no one looking for you,” said Jessica Vaughan, director of policy studies at the Center for Immigration Studies. Meanwhile, the Administration nearly doubles H-2B guest program… which brings many Mexican workers (SF Gate & Wash. Post) — that’s DHS and Labor Dept., they plan to grant an additional 30,000 H-2B visas this summer on top of the 33,000 H-2B visas they had planned to give out. We’ll see if that changes under new leadership…? The H-2B visa is for foreign workers to come to the United States and work for several months at a company such as a landscaper, amusement park or hotel. About 80 percent of these visas went to people from Mexico and Central America last year, government data show. Not good. (Fox News) Dog the Bounty Hunter, Duane Dog Chapman’s wife, Beth, is resting at home after hospitalization. On Saturday Beth Chapman was “rushed to a Hawaii hospital with serious breathing issues,” a source told Us Weekly. “She hasn’t been feeling well of late and Dog is by her side.” Beth, 51, began chemotherapy in December to treat stage II throat cancer after being hospitalized in November for a mass in her throat. In January, Duane and Beth become great-grandparents after Duane’s grandson, Dakota, welcomed his first child. Duane ‘Dog’ Chapman (who’s friends with Jesse) previously told Fox News, "Through this cancer episode, we had to drum up as much faith as we could. And the Bible talks about having faith as small as a mustard seed. And that’s not much … And I thank God that we had at least that much faith to get her through that." People try to get a good outcome while doing wrong. Jesse led the Couple’s Seminar. Church was great — we need a bigger building, and they may demolish ours. Support BOND. The wall goin’ up! Kirstjen Nielson resigns. Callers talk to Jesse including T — he black. Jesse gave marriage and relationship advice just as Jesus and Paul did, and none were themselves married. You don’t have to be married to know the truth. BOTTOM OF FIRST HOUR: Biblical Question and Super Chats. Hands off the meat, globalists! Another caller woman said she’s the child, but she’s 35, and Jesse talks with her about family issues. Cliff of Arkansas, 1st-timer, argues with Jesse about stereotypes of immoral blacks, whether LeBron James is a good role model. But he does support Trump as pro-black in certain ways. He brings up how people hire illegals and immigrants instead of qualified blacks. He asks good questions about Barack Obama, saying Obama dated white women, and his portrait artist painted pictures of black women holding decapitated heads of white women — but his mother’s white. How’s he feel about that? And he says Obama’s Presidential Library in Chicago employs mostly whites, not blacks. BTW: WND’s founder Joseph Farah had a serious stroke recently. David Kupelian wrote March 28 that he was home resting after several days in the hospital. Jospeh has led WND for 22 years. Jeff Bezos’s blog Wash. Post did a hit piece on WND as soon as they heard. Wash. Post promoted the Russian Collusion madness that turned out to be fake news, and compared Trump to Hitler quite a bit. As Tucker Carlson said, Wash. Post is a joke. (CNN) Jennifer Hart drove her “family” off a cliff as her “wife” looked up how much they would suffer, a jury says — lesbians killing their six adopted children: Markis, 19, Jeremiah and Abigail, both 14, Devonte, 15, Hannah, 16, and Ciera, 12. Greusome. The SUV drove off a 100-foot Pacific coast cliff in March last year. Jennifer had 5 beers in her system driving down the 101. Witnesses said she was rarely drunk — the theory is she did it to have the nerve to do it. The other lesbian, Sarah, searched: "How easily can I overdose on over the counter medications?" "Can 500mg of Benadryl kill a 125lb woman?" "How long does it take to die from hypothermia while drowning in a car?" Two years after the adoption, in 2008, one child told an adult that Jennifer hit the child in the arm. But Minnesota closed the case, claiming the child fell. In 2011, Sarah Hart pleaded guilty to domestic assault after admitting to police she bruised her child by spanking her over the edge of a bathtub. After the “family” moved to Washington state, the children started going to their neighbor, Bruce DeKalb, for help and food in the middle of the night. The children also complained about “racist” behavior. (Drudge) Former Paper Editor: Media Parroted 'SOUTHERN POVERTY' Releases… (In Oregon Live & Wash. Post) Journalist Jim Tharpe says the SPLC should be investigated — they center abruptly fired their cofounder Morris Dees in March, and put Karen Baynes-Dunning to serve as interim president and CEO, giving the civil rights organization its first black female leader. The org is accused of “racial discrimination and sexual harassment.” More than 20 years ago Tharpe wanted to investigate the center. In 1994, a group published a series reporting a litany of problems and questionable practices, misleading donors, exaggerating accomplishments, spending money mostly on raising money, and lavish salaries for top staffers (including Dees and Richard Cohen). Jesse rails on fat governor of Illinois raising the buying age of tobacco and e-cigarettes to 21 instead of 18. Chris of CA, 1st timer, thanks Jesse. His son has a birthday arond this time. Orlando of SC, 1st-timer, is Mexican. He calls Joel a puppet, oddly. Biblical Question: Do you believe your truth is your own? He has trouble saying whether he’s a Christian because he is not educated on the church stuff. He’s 48, separated, and has a few kids. His wife is a liar and drunk. His 29-y-o son said he wants to piss on his father’s grave. His kids listen to his wife who’s a drunk. Jesse urges him to apologize to his children. (Drudge) Anti-abortion film a surprise box office success… (Yahoo News) It’s about a former employee of an abortion organization who became a pro-life activist. "Unplanned," released in theaters March 29, pulled in more than 8.6 million dollars in North America — got an unexpected fourth place for the week behind the much bigger budget pictures "Dumbo," "Us," and "Captain Marvel." Abortion was supposedly “legalized” in 1973 in the controversial Roe v Wade Supreme Court decision. VP Mike Pence tweeted promoting the movie. It has an R-rating. Most cable TV channels reportedly refused to air ads for the film. "Unplanned" is based on a book by the same name by Abby Johnson, a former director of an abortion clinic in Bryan, Texas, run by the abortion giant Planned Parenthood. It’s said to be an exact re-telling of her book. Most states allow abortion up to 24 weeks. In Georgia, state lawmakers last month passed a bill that would ban abortions once the baby’s heartbeat is detected, which can be as early as six weeks (maybe sooner). The governor has to sign it, and is expected to be challenged in courts by evil people. (Drudge) Conservative takeover of Supreme Court stalled by Roberts-Kavanaugh bromance… (USA Today) Chief Justice John Roberts and the court's newest member, Brett Kavanaugh, have voted in tandem on nearly every case that's come before them since Kavanaugh joined the court in October. They've been more likely to side with the court's liberal justices than its other conservatives. BETA MALES! Their “partnership” has extended, though less reliably, to orders the court has issued on abortion funding, immigration and the death penalty in the six months since Kavanaugh's bitter Senate confirmation battle ended in a 50-48 vote. The chief justice has voiced concern about the court being viewed as just another political branch of government. (Drudge) LIL NAS X Gets His Number 1 on Country Chart… BILLBOARD Backtrack? (ShowBiz411) Billboard took Lil Nas X’s country song, “Old Town Road,” off its country chart. So Lil Nas X added Billy Ray Cyrus to the remix. Now it’s number one on the iTunes pop chart AND country chart. ShowBiz411 says Billboard will have to backtrack. Redefining Genre…? (Daily Beast) says it’s a turning point for country music — the 19-y-o rapper’s trap-country music removal from Billboard’s charts sparked accusations of discrimination against Billboard from his fellow rappers, including Tyga and Ski Mask Slump. Jesse mentions Nipsey Hussle who Jesse’s PR guy says was a good dude, but made a song “FDT (F— Donald Trump)” with fellow rapper YG. Nipsey was murdered in L.A., and caller Ebony mentioned him last hour. Kirk of CA, 1st-timer, tries to say we need some anger, just not the negative aspects of anger. BOTTOM OF HOUR: Super Chats. AOC talked black!